Britain's largest bird of prey, the White-tailed Eagle or sea eagle, is a magnificent, if rare, sight in the wilder reaches of western Scotland. This massive bird, the world's fourth largest eagle, with a wingspan stretching 8 feet across, was shot to extinction in Britain in 1918. In the latter half of the twentieth century there were two formal reintroductions into Scotland from birds of Norwegian stock. A total of 140 birds were released in two areas one on Rum from 1975 to 1985 and the other in Wester Ross from 1993 to1998. These released birds first successfully bred in Scotland in 1983 and have gone on to establish a population of over fifty breeding pairs on the west coast of Scotland. Historically J.A. Gibson "The Birds of the Island of Arran" (1956) and R. Gray "The Birds of Arran" (1872) report breeding in Glen Catacol up to 1870. After these recent Scottish reintroductions, the nearest breeding pair is on Jura. Over the last few years there have been a few records of this species on Arran. In 2010 there were three records, in 2009 there were two records, in 2008 again there were two records, in 2007 none and in 2006 there was one record. These have mainly been of immature birds. While breeding adults tend to stay close to their territory throughout the year, immature and non-breeding birds may range quite widely to find sufficient food. In October this year, there were at least two immature birds on Arran - one was photographed just north of Dougarie on 12 October and another with a visible red wing tag was first photographed at Shannochie on 30 October. These were the first time this species has been photographed on Arran. In addition the tagged bird hung around for four days. Again this was a "first", all previous reports have been of fleeting visits. The red tagged bird was one released this year in Fife. 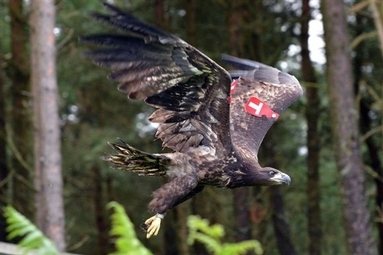 The East Scotland Sea Eagle project started in 2007. Again using Norwegian stock, it is hoped to establish a breeding population in the east of Scotland. The information from the tags is that this red tagged bird is a 1st-year male brought from Norway to a secret location in Fife in the spring by the RSPB and released from there in late August. The photograph was taken on the release day. White-tailed eagles normally breed at 5 - 6 years of age. In Scotland, they spend the winter in courtship and nest building, and eggs are laid in March. Females normally lay 1 - 2 eggs, which are incubated for about 38 days. Exceptionally, 3 young are raised from successful nests each year. Young birds remain in the nest for 10 - 13 weeks before fledging. Although they are capable of taking care of themselves about 30 days after leaving the nest, they will continue to beg for food from the adults for several months. The young eagle will then spend about 5 years in non-breeding areas, often in the company of other non-breeders. In birds of prey generally, up to 60 - 70% of all young that leave the nests will not survive their first winter. This figure is probably significantly lower for large raptors such as the White-tailed Eagle, but a young eagle still faces a life or death struggle through its first winter. After surviving that first year, a young eagle may well then live for more than 20 years.